Giorgia Meloni, the youth minister of Italy, has recently expressed his indignation at the persecution of Falun Gong practitioners in China. On November 13, 2010, Falun Gong practitioners from more than twenty countries, including the United Kingdom, Germany, France, Italy, Sweden, the Netherlands and Belgium, gathered in Rome, the capital of Italy, to hold a massive parade. Many EU and Italian officials wrote letters or came to join in the parade in support of Falun Gong. 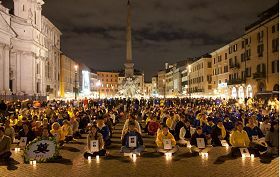 In his letter, Giorgia Meloni, the youth Minister of Italy, said, "I feel very indignant at the persecution of Falun Gong practitioners in China" and "The free world should not turn a blind eye to the facts of hundreds of millions of people who have lost their freedom of thought, belief, religion and association." 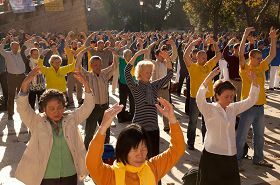 On the morning of November 13, 2010, Falun Gong practitioners practised the Falun Gong exercises collectively in Rome's Victoria Park. 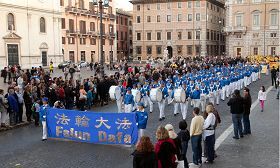 The parade of Falun Gong practitioners leaving the Mouth of Truth Square in Rome. Falun Gong practitioners held a candlelight vigil at the Four Rivers Fountain Square at 6:00 p.m., mourning their fellow practitioners who were persecuted to death by the Chinese Communist Party (CCP). Giorgia Meloni, the youth minister of Italy, said in his letter of support sent to the parade, "I feel very indignant at the persecution of Falun Gong practitioners in China. No one has the right to restrict people from practicing this ancient meditation for the purpose of cultivating mind and body and they are a peaceful group which does not spread violence and hatred." While talking about the atrocities of the CCP's persecution of Falun Gong, Giorgia pointed out that the CCP, like all the dictatorships, has the characteristics of an evil cult which always spare no effort to suppress orthodox belief. He said, "Suppressing the voice of the people's hearts is the common characteristics of all the dictatorships. All the dictatorships have adopted this kind of 'religious' form as the centre of worship by a person or a party." Meloni called on the Western world to helping stop the CCP's persecution of Falun Gong. He said, "The free world should not turn a blind eye to the facts of hundreds of millions of people who have lost their freedom of thought, belief, religion and association." EU MP Claudio Morgandi also sent a letter to the Italian Falun Dafa Association, in which he expressed his support for Falun Gong and his hopes to stop the brutal persecution in China. MP Morgandi condemned the evil hand of the CCP violating human rights which has been extended from the persecution of Falun Gong to the world, jeopardizing the interests of the European countries. He said, "I express great sympathy for Falun Gong practitioners who have suffered the persecution. The CCP does not respect this ancient cultivation method, at which I express my indignation. The CCP has continuously adopted the policy of brainwashing the people for fear of losing support of the people." MP Morgandi expressed his recognition of the philosophy of Truthfulness-Compassion-Tolerance which Falun Gong practitioners follow.